When writing an assessment, you will need to incorporate information and examples from readings. Readings may include your class notes/manual, books and eBooks from the Navitas Library and good quality, reliable information from the internet. An example of how a student has done this is given below. 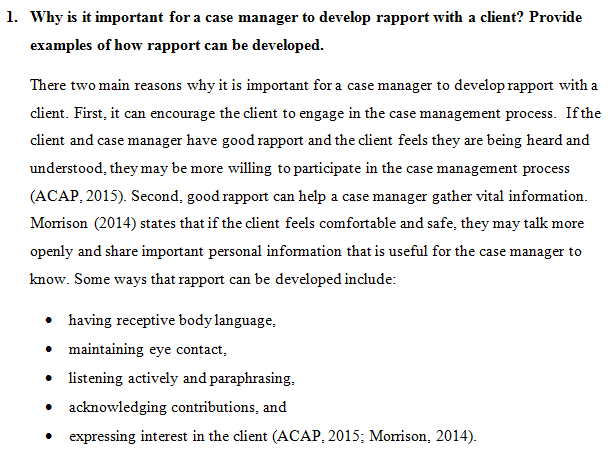 The assessment requires the student to answer the following sort answer question: Why is it important for a case manager to develop rapport with a client? 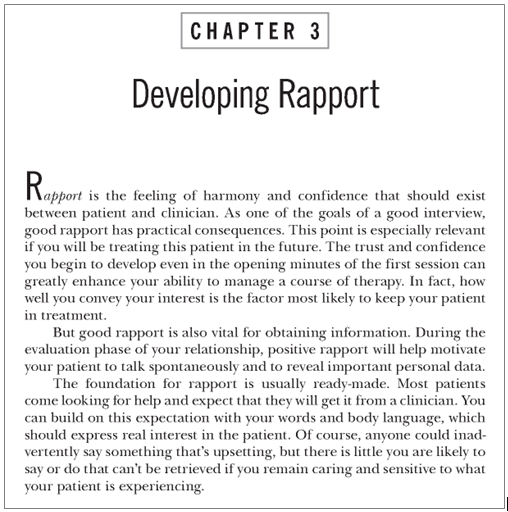 Provide examples of how rapport can be developed. The student found some relevant information on rapport in the manual for the unit he is undertaking (Facilitating Case Management) and a book he found in the Navitas Library. The relevant sections of these sources he found are given below. Then, the student has written his answer and incorporated information from these two sources. Notice that he has paraphrased the information (put it in his own words as much as possible) and has also in-text referenced the information to show the reader where the information comes from.